Back in November we made the case that USDJPY appeared to be finishing an Elliott wave triangle and that a setup was developing with good risk/reward characteristics. We also reviewed the trade setup in a November webinar that was archived in case you missed it. The objective of the trade was to move back above May highs and now those levels have been reached. While it cannot be ruled out that USD/JPY may continue substantially higher, there are good reasons to to be protective of gains now the the goal has been met. 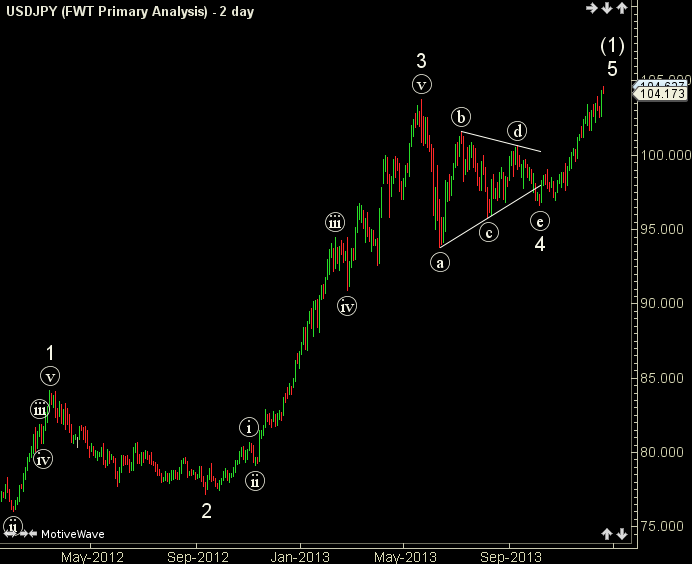 One aspect of Elliott wave triangles is that they are always the next to last move in a sequence. Therefore, once the move up from the triangle is complete, that should be the last leg up in the move from 2011 lows before a larger downward correction completes. So even if the thrust upward continues substantially, since the objective of a new high has been met, the trade could be on borrowed time. Even though the still higher could be on the agenda, it makes sense to me to take advantage of the fact that our target has been hit, especially with the risk of a reversal at any time.